Is a Pretty Smile After 20 Years of Dentures Possible? I’ve had dentures for about 20 years. I’ve never liked how they looked, but what could I do. Dentures are dentures. I’m wondering if it’s possible to get a beautiful smile now. I’ve learned about dental implants and think they’d be awesome. I’m sorry you’ve spent this many years disappointed in your smile. That had to be hard for you. Fortunately, you won’t have to stay that way. You can have a beautiful smile again. You’ve had dentures for quite some time. There is an unfortunate side affect of this where you begin to lose some of the bone that usually retains the roots of your teeth. Your body starts reabsorbing the minerals in your jawbone to use elsewhere in your body where it perceives they would be more necessary. After a number of years (definitely by 20) you no longer have enough bone to support dental implants. This is known as facial collapse. You can still get them as long as you take one additional step. You’ll need to find a dentist who does bone grafting. This builds the bone back up so the dental implants can be retained. 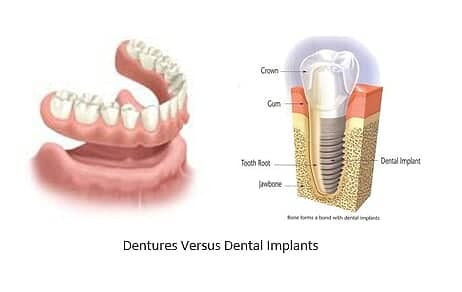 Truthfully, the key to a beautiful smile, regardless of whether you get dentures or dental implants, is the dentist you chose. A skilled cosmetic dentist will give you a stunning smile. So where do you find this miracle worker? The mynewsmile.com website is one which screens cosmetic dentists. They verify their training, skill, and artistry. Anyone listed on their website will be a great option for you.